Posted By:Unknown | At:10:06 AM Be the first to comment! 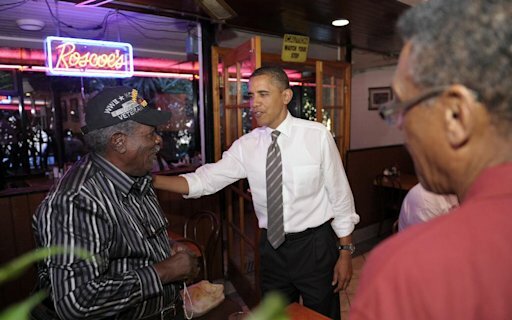 While in Los Angeles for a campaign fundraiser, President Barack Obama made a stop at the legendary Roscoe's Chicken and Waffles. Indeed, the presence of the leader of the 'Free World' cause quite a frenzy. 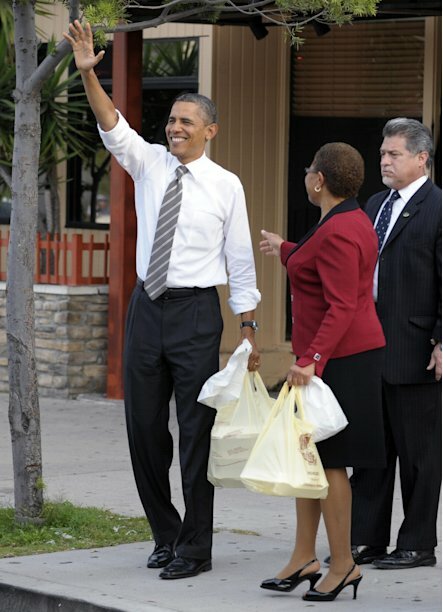 The President got a to-go order for himself, Rep. Karen Bass, Valerie Jarrett, Jay Carney, David Plouffe, and Marvin Nicholson. He then proceeded to walk around the resturant and shake the hands of all the patrons while they were seated at their booths. Oh and just in case you were wondering what he ordered, here is what was reported: Obama ordered the No. 9, "Country Boy," which includes wings with a choice of waffle, potato salad or french fries.